Make your exclusive tour to La Maddalena or Corsica, you will have new motorboats and inflatable boats (RIB) for rent with the highest standards of comfort, safety and quality. 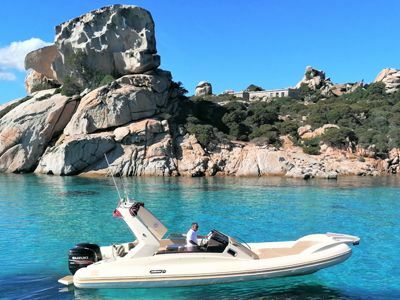 Choose to rent a private boat with Skipper, you will visit the isles of the archipelago of La Maddalena and Corsica by our top level inflatable boat “The One”. A Solemar Offshore NEW 28 of 9 mt with a twin Suzuki engines 200 horsepower. Maximum load 10 people. 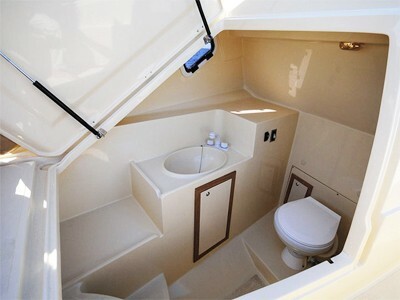 On board you'll find everything you might need: snorkeling equipment (diving mask and snorkel), beach towels, comfortable cushions, awning, table, toilet, external shower, refrigerator, sound system, anchor winch, safety equipment and boarding ladder. The inflatable boat “Adventure” is your perfect choice for an organized boat trip with just few other people. It’s a wonderful AT 7 with a Suzuki engine 200 horsepower, maximum load 8 people. On board: sound system, awning, safety equipment and boarding ladders. We have two new boats of 22 meters with twin engines to receive 100 passengers comfortably. On board: bar and restaurant, main deck with tables and sofas, panoramic deck, solarium, music center, led TV, awning, two toilets, approved gangways and boarding ladders.